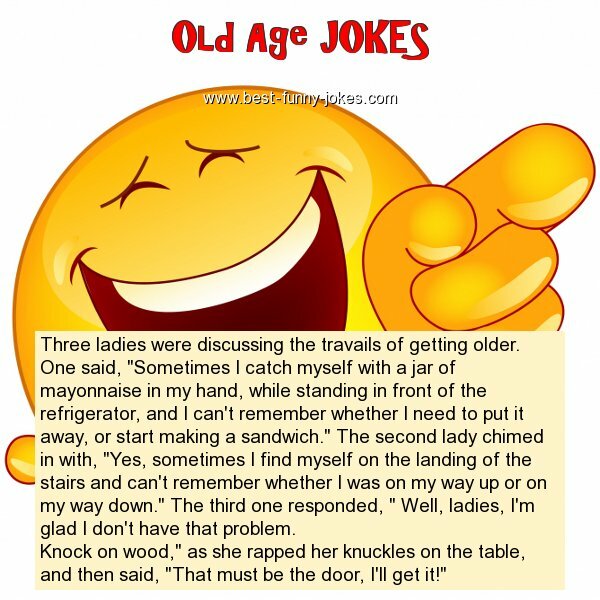 Three ladies were discussing the travails of getting older. One said, "Sometimes I catch myself with a jar of mayonnaise in my hand, while standing in front of the refrigerator, and I can't remember whether I need to put it away, or start making a sandwich." The second lady chimed in with, "Yes, sometimes I find myself on the landing of the stairs and can't remember whether I was on my way up or on my way down." The third one responded, " Well, ladies, I'm glad I don't have that problem. Knock on wood," as she rapped her knuckles on the table, and then said, "That must be the door, I'll get it!"